Do you have a 1980’s Chevy Silverado? How about a 1990’s Jeep Wrangler? Or even that 1970’s Ford Bronco. Do you need a complete makeover of your beloved ride? 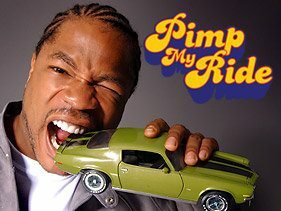 MTV has hosted their show “Pimp My Ride” since 2005 which will fulfill your needs for a luxury makeover. The talented team at West Coast Customs in California have come together to turn these junk yard demons into “pimped” out cars worth upwards of 30,000. Hip Hop legend Xzibit along with custom car designer Mad Mike search the country for the most unruly, disheveled junk cars expelling their passion to create works of art and surprise the car’s owner. With a theme song that rattles in people’s mind and the slogan of “You’ve officially been pimped,” you know this show is going to be good. A typical conversion from junk to masterpiece takes about 12 days and a team of eight (Xzibit, Mad Mike, Beau, Luis, Gyasi, Diggity Dave, Jason and Z). Participants make a request and express their interest and need for their car to be pimped. The main garage is located at West Coast Customs, only to be replaced in season five by GAS- Galpin Auto Sports. Only the most disastrous cars make it to the show, where Xzibit will make a surprise appearance to the participants home. Upgrades tend to be specific, such as one participant who was a surf bum driving around a Volkswagen Bus and had a custom clothes dryer installed for after his surf sessions. Talk about a mobile paradise! Tactical and whimsical upgrades are the goal of this West Coast team. Hosting worldwide popularity, Pimp My Ride can now be found in the US, Canada, Europe, The Middle East, South America, Pakistan and even Malaysia. In New Zealand you will find Meke My Waka which airs on Maori television. The complete first season started in March of 2005, and the fifth season in November of 2008. In addition to the TV show, Pimp My Ride is also a video game. Youtube parodies, theme songs, similar viewing programs and even car commercials have all sprouted from the creation of this TV series. As far as staff goes, you will find owner and car specialist Ryan Friedlinghaus running the show, along with Manager of West Coast Customs, Q. Heading down to tires is Alex and pimping out the interior (the most important part some would say) is fabric extraordinaire Ish. Mad Mike who’s real name is Mike Martin takes care of all of the electronics and engineering, ensuring that the rides receive the highest quality of sound and bass. Finally, you can’t have a pimped out ride without a creative paint job. Taking care of the exterior colors and designs are Aren, Jimmy, Buck, 2Shae and Luis. Together this team will pimp your ride! Trevor Crawford is a freelance writer who focuses on cars, transportation, car upkeep and maintenance, car gadgetry, car career opportunities, and other similar subjects; those looking for careers in the transportation industry should view the resources at cdl jobs.